After a thoroughly enjoyable Southeast Asia tour over the Summer, I will be returning to Singapore and Malaysia at the beginning of November. This time, I’ll be predominantly based in Kuala Lumpur (where I’m looking forward to presenting at the UCSI University Piano Pedagogy Conference, and giving presentations for Schott Music), but will also be briefly visiting Singapore too, for lessons and a workshop (see flyer below). 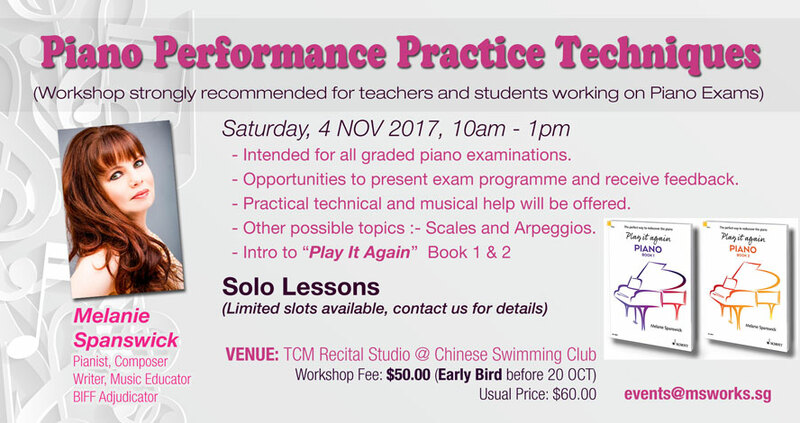 This workshop is intended for students, parents and teachers, or anyone preparing for a piano exam of any level or any examination board. We will discuss practice methods and preparation, and a number of students will have the opportunity to play their programme (or part of their programme) to a friendly audience, after which they will receive helpful, constructive feedback as we work on various technical and musical ideas to improve performances. There will also be a chance to present technical work such as scales and arpeggios.